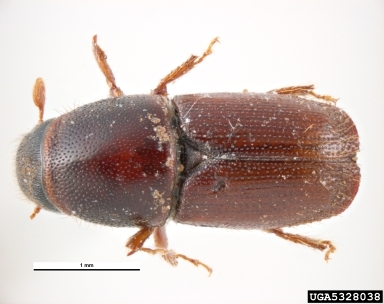 The Smaller European Elm Bark Beetle (Scolytus multistriatus) is a vector for the fungus Dutch Elm Disease (Ceratocystis ulmi) and uses Ulnus spp. as a host. Five years of trapping efforts for the USDA APHIS PPQ National Woodboring Bark Beetle Survey Program have identified several potential pests of concern. The Smaller European Elm Bark Beetle is common throughout the Western US. It has been found in two Wyoming counties. One hundred thirty-five total forest pest traps have been placed throughout twenty-three counties in Wyoming. The lure used to attract Scolytus multistriatus also attracts Scolytus schevyrewi.